The Chiltern Model Railway Association is holding a Model Railway Exhibition Conference on the 11th May 2019. The idea behind the conference is to gain the views and experience of those who organise or help at exhibitions, exhibit with a layout or stand, attend model railway exhibitions as a trader or as a member of the paying public. This with the view to improve the experience of all involved in promoting the hobby through model railway exhibitions both small and large. Participant's Perspective - Stand Presentation. Exhibitors and visitors experience. Social meetings. Best in show awards. The conference poster can be downloaded by clicking here. 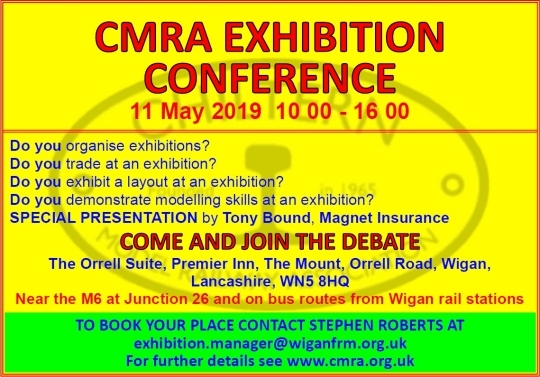 The Conference is free but so that we can put in place the necessary catering for the event please can all those thinking of attending please email Stephen Roberts using the address exhibition.manager@wiganfrm.org.uk. 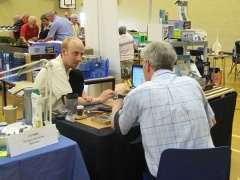 The Chiltern Model Railway Association will be holding an Interactive Modeller's Workshop in 2019. The day involves modellers who belong to member organisations of the CMRA, presenting and demonstrating items of modelling interest to colleagues in a relaxed atmosphere, away from exhibition constraints. The event will also incorporate films, talks, discussions and practical demonstrations, some by leading figures in the railway modelling hobby. The event is open to all members of our Associate organisations, and to non-members. It is one of those pleasant opportunities to talk, listen, learn and pass on your ideas to like minded modellers, indeed all participants are encouraged to reserve table space so as to bring along their models and share their experiences. Admission includes tea, coffee and an excellent buffet lunch - what more could you ask for? The event handbill can be downloaded by clicking here. Due to the nature of the event there will be no admission on the day without a pre-booked ticket.